Meteorologist Cory Reppenhagen traveled out to Washington County during last Friday's powerful blizzard. Here's what he saw. Meteorologist Cory Reppenhagen traveled out to Washington County during last Friday's powerful blizzard. Here's a timeline and blog of what he saw. 7:30 a.m. - I loaded into the 9NEWS Weather Titan, and got an early start. My target was I-76 between Brush and Julesburg. I left early because I figured there was a very good chance the roads were going to start closing before noon on Friday. Just wanted to get out there before the first closure. I packed the truck with snacks, water, pillow, and blanket, because I figured there was a good chance I wouldn't make it home Friday night. 10:00 a.m. - Temperatures were still holding above freezing for most of the I-76 corridor. The wind was starting to blow strong out of the north, but it was still mostly rain. Except in Washington County near Brush. That was one of the first spots to switch over to snow, so I decided to take Highway 34 towards Akron. 10:30 a.m. - On Highway 34 I encountered blizzard conditions about half way between Brush and Akron. Strong winds were blowing snow from north to south, and visibility was already down to about 20 yards. The snow was just starting to stick to the road. 10:45 a.m. - A good bit of snow was packing down onto the road. The first semi truck slid off the highway just a few miles west of Akron. The Colorado Highway Patrol said there were 7 more trucks that would get stuck near there, shortly after this one. 11:15 a.m. - Highway 34 closed between Akron and Brush. I did my first live report at the road block in Akron at noon. By 12:45, Highway 34 was closed in both directions, and so was Highway 63. I was affectively stuck in Akron, and I knew at that point that I would likely be there for the night. 1:30 p.m. - The WeatherTitan was measuring 50 to 55 mph sustained winds, with gusts over 60. It was creating massive snow drifts, and snapping the tops of trees. My location was Sixth Street and Grand Avenue. I would return to this spot to do my live reports in the 4 p.m. and 5 p.m. newscasts. 6:00 p.m. - Knowing that I was staying in Akron for the night, I checked with local hotels for vacancies. Mojos Inn, and Gemma's Crossing were both booked with stranded motorists. Washington County officials had opened an emergency shelter at the Fairgrounds and Event Center. That presented an option. 6:30 p.m. - I continued to survey the town for storm impacts. The storm was very comparable to the 15 hurricanes that I have covered, except it was tiny wet snowflakes instead of rain drops that were getting driven by the strong winds. Moisture would find it's way into the tiniest openings in my clothes or my truck, and even my camera cover. I had to move my camera inside the truck, and shoot through the windows, because it was just getting to wet outside. The sound of the wind howling was exactly like it sounds in a hurricane. 7:15 p.m. - Met a local cowboy named Steve Diamond. 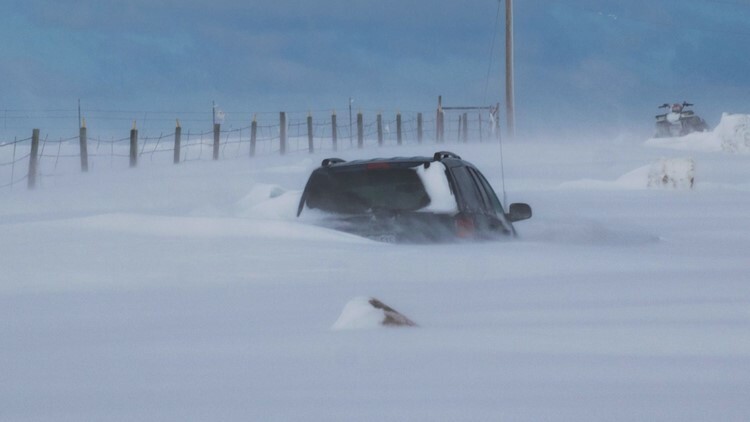 He told me that he had been pulling stranded vehicles out of the snow, and was trying to keep an eye on his cattle. He said it was calving season, and the babies born in the spring would be in danger over night. He said the cows will do anything they can to escape the wind, and usually end up wandering far from home.He said he was going to be very busy trying to find the calves when the sun comes up. I heard a few stories the next day about calves that died during the storm, but not nearly as many as I thought there might be. 10:30 p.m. - After doing live reports for our 9 and 10 p.m. newscasts, I met up with Akron local Carlos Camacho. He told me that his dad was cooking homemade burritos, and offered me a meal and a place to stay for the night. A long day in the blizzard ended with a comfortable night. 8:30 a.m. - With the roads still closed on Saturday morning, I started to shoot video and interview people for an update on our evening news. I saw massive 6 to 8 foot snow drifts around town, including at the High School, where the dugouts at the baseball field were covered with drifts. 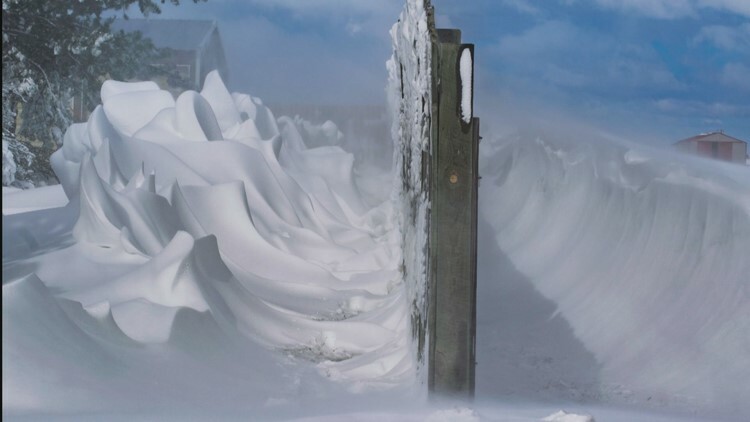 The way the wind moves over, and across things, and twists, and curls, creates some impressive sculptures with snow. I shot some amazing examples of this on the northwest side of town. 10:00 a.m. - Saw a couple of vehicles on County Road 41.5 that were nearly buried in snow drifts. The entire road was covered with about a 4 to 5 foot drift. Motorists attempted to use county roads to get around highway closures during the storm. Some people were rescued from their vehicles, and some found other ways to get home, but there were no reports of injuries or fatalities. 3:00 p.m. - Highway 34 finally reopened west bound to Brush. I filed one last report and made my way back to Denver. This will go down as a historic storm. It hit Washington, Logan, Phillips, and Sedgwick Counties the hardest, along with some parts of the Nebraska Panhandle along I-80. Many Washington County residents were calling this the most powerful blizzard since 2003. The water from this storm was great. The average precipitation for Washington County is 1.5 inches in April. Some spots there got close to that in just that one day.